Nitrogen Generator Systems | Membrane & PSA Nitrogen Generators | Brenner-Fiedler & Associates, Inc.
Brenner-Fielder is an industry leader in providing nitrogen generators and custom engineered nitrogen generator systems. We can design any size nitrogen generator system to meet your specific needs, schedule or budget. Our nitrogen generator systems deliver low operating costs and rapid return on investment. Our dedicated specialists are ready to assist you in finding the nitrogen generator that meets your needs, including systems that require compliance with the FDA and GFSI standards. A Parker Balston N2 Nitrogen Generator will pay for itself in little to no time at all usually averaging only $0.30 cents per 100 SCF where bulk can cost in excess of 5x that amount. - Eliminate your monthly nitrogen expense. - No annual contracts, delivery fees, or monthly rental costs. - Easy setup and installation with minimal maintenance. - Use of existing compressed air to operate, in most cases. - No storage of dangerous high-pressure cylinders or HAZMAT fees for bulk storage. - Ability to produce nitrogen on demand where relying on suppliers to deliver nitrogen can lead to lost production if you run out. - Typical ROI is 1 - 3 years depending on usage. - O2 analyzers are available for measuring oxygen down to trace levels (ppm) if needed. - On PSA units, final stage filtration removes bacteria and is USDA/FDA accepted. Some units can enter economy mode when storage is full so there will be no waste, where bulk tanks release built up pressure when not being used and cylinders are not always used in full resulting in wasted nitrogen and wasted money. 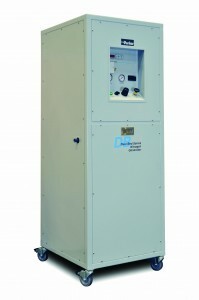 Parker Balston Membrane Nitrogen Generators utilize proprietary membrane separation technology. The membrane separates compressed air into two streams: one is 95%-99% pure nitrogen, and the other is air enriched with oxygen, carbon dioxide, water and other gases. Our systems come complete with pre-filtration and a final filter. Parker Balston PSA Nitrogen Generators produce up to 99.999% pure, compressed nitrogen at dew points to -58°F (-50°C) from nearly any compressed air supply. The generators are designed to continually transform standard compressed air into nitrogen at safe, regulated pressures without operator attention. Our systems come complete with pre-filtration and a final filter that puts them in full compliance with FDA and GFSI requirements. You can find additional Product Literature here - Balston Nitrogen Generators.